Daniell had been asked for his “takeaway” from the meeting, and he acknowledged poor communication from the county from when it first started talking about putting a sewer line down Calls Creek in February of last year until the present. Daniell also criticized himself for how he handled a Jan. 16 meeting on county planning for water resource management where citizens complained that they were not being given a chance to voice their concerns. The meeting on Wednesday night was a consequence of that complaint. Jim McGarvey, president of Friends of Calls Creek, said at the beginning of the session on Wednesday (Jan. 24) that Daniell contacted him following the public forum at the Civic Center on Jan. 16 and suggested the second meeting. The gathering, which McGarvey organized on behalf of Friends of Calls Creek, took place at the Oconee County Library in Watkinsville, with 35 citizens attending. Commissioner Chuck Horton also was present and spoke, though most of the questions were directed at Daniell. McGarvey thanked Daniell for being willing to meet with the citizens before opening the session up for questions. The Friends of Calls Creek has organized opposition to a proposed sewer line down Calls Creek to the Middle Oconee River from the county's wastewater treatment plan on the north side of Watkinsville. 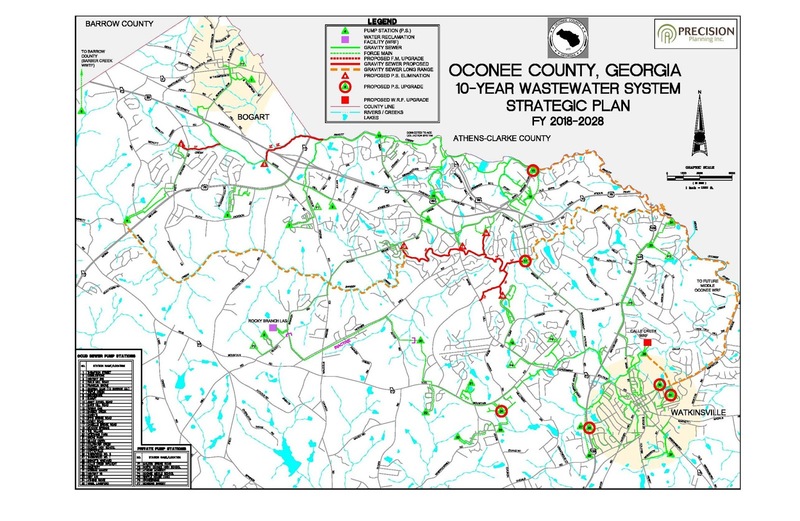 As citizens entered the room at the library, they were given a copy of a map labeled 10-Year Wastewater System Strategic Plan FY 2018-2018, prepared by Precision Planning Inc. of Monroe, a county consulting firm. McGarvey had the map blown up and on an easel at the front of the room as well. 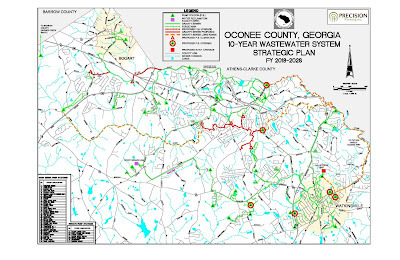 I had included the map in a post on Dec. 30 regarding the agenda for the Jan. 2 Board of Commissioners meeting, which contained a report by Oconee County Water Resources Department Director Wayne Haynie on the status of the Water and Wastewater Master Plan under development. I had seen the map on the wall outside the Water Resources Department at the Government Annex on SR 15 on the south side of Watkinsville and obtained a copy from Jenanne White, Water Resources Department administrative assistant. David Jackson, a member of the citizen committee revising the county’s Comprehensive Plan, had noted the map and told me about it. McGarvey had read my Dec. 30 post and asked me for a copy of the map on Jan. 12. I sent it to him that same day. The map does not show any sewer line running down Call Creek. Instead, it shows treated sewage from the Calls Creek plant, running via a gravity line down Simonton Bridge Road to the Middle Oconee River. Daniell was quick to point out the deletion of the Calls Creek line. “There’s not a single pipe going down Calls Creek,” Daniell said. He also said he wished the map had not been publicly displayed to this point. Though the meeting had been organized by Friends of Calls Creek, many of those who attended and spoke live along and were more concerned about Barber Creek. The map shows a sewer lines ultimately running all the way down Barber Creek, which traverses the northern part of the county. 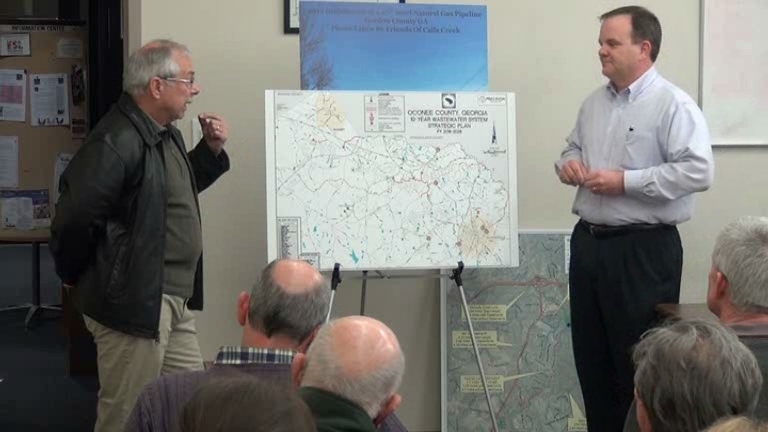 Included is a proposed new gravity line from Daniells Bridge Road to its intersection with McNutt Creek after both creeks flow under U.S. 441 at the Clarke County line. Allan Antley, who lives at 1040 Lake Wellbrook Drive in Lake Wellbrook subdivision, wanted Daniell to know what the proposed gravity line meant to him. “I lose sleep over the fact that someone’s thinking about putting a sewer in my back yard,” Antley said. “Twenty years ago, when I moved here, I specifically went to your Utility Department and asked that question: Are there any plans for this? Of course, 20 years ago there weren’t.” The Utility Department is now the Water Resources Department. “There were no easements on our plots,” Antley said of his and his neighbor’s property. “We understand the county needs to do some things, but we need to find solutions that don’t unduly burden the folks that live on these creeks,” Antley said. I live just downstream and across Barber Creek from Antley at 1050 Scott Terrace in Welbrook Farms subdivision, and I organized Friends of Barber Creek more than 10 years ago and currently serve as its president. During one of the more contentious parts of the meeting, a citizen asked for a time frame for the decision to put a sewer line down Barber Creek. “That’s what we’re looking at,” Daniell said in response. “Well, we kind of would like to know,” the woman replied. “Because, honestly, that’s why we bought our house–for that creek. Daniell said the Board of Commissioners would need to adopt a plan before any time frame could be known. Vickie Krugman, 1190 Thornwell Drive, near Calls Creek, said that a 10-year plan was not enough. In the past, the county has not thought long-term, she said. Krugman said the county should invest the money it takes to provide the needed infrastructure. Daniell said the county had handled the issue of sewer lines very poorly. “From the day the people showed up in your yard, whether you got the letter or not, we acknowledge a whole lot of miscommunication,” Daniell said. People along Calls Creek learned of the possible sewer line down the creek when surveyers showed up in February of 2016. “All I’m trying to get from the meeting last week and the meeting tonight is to open up the dialog,” Daniell said. “We don’t want it to be a surprise. When one citizen, near the near the end of the meeting, said the commissioners were going to make their decision regardless of what citizens were saying, Horton stood to respond. The group applauded again shortly after that when McGarvey asked it to thank Daniell and Horton for coming to the meeting. The video below is of the entire meeting on Wednesday night. Daniell made his first comments on the Calls Creek Line at 6:00 in the video. Antley began his argument about the impact of the line down Barber Creek at 10:08. The question about the time frame for the line down Barber Creek was posed at 18:24 in the video. Krugman’s comments are at 28:45. Horton’s comments start at 1:01:58. Daniell responded to the question about his “takeaway” from the meeting at 1:11:54. OCO: Friends Of Calls Creek 1 24 18 from Lee Becker on Vimeo. Good for Daniell and Horton to have a second meeting. Where was Bubber, Thomas & Saxon? When it comes to communication, until Oconee County Water Resources Department Director Wayne Haynie learns humility and listening skills, this county resident will remain skeptical. No more "safe spaces", Wayne. 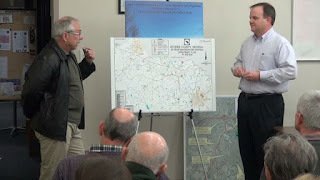 Oconee County Utility Department Director Wayne Haynie told the Northeast Georgia Branch of the American Society of Civil Engineers that he would help them understand “the fuss” over the county’s plans to put a sewer pipeline down Calls Creek. Haynie objected to the camera when he stood up to talk, however, saying he was hoping to have a “safe space” among the civil engineers to talk about the controversy over the county’s plans to expand its Calls Creek wastewater treatment plant and run a discharge pipeline through the neighborhoods along the creek. Haynie went forward with his talk–and explanation of the controversy the pipeline had raised–only after the engineering group voted to ask McGarvey to turn off the camera and she complied. Yes, there has been a communication problem and it stems from Mr. Haynie who may be highly qualified in his area of expertise, but is definitely not a people person. I do appreciate Mr. Daniell and Mr. Horton who are acting as highly responsible and concerned leaders. It is a good question as to where commissioners Wilkes, Saxon, and Thomas were. But you may notice that at the town halls, commissioners Daniell and Horton come out and talk to folks, while commissioners Wilkes and Saxon stay behind the desk and commissioner Thomas is often late. Hopefully voters will remember this when the next election comes around. Being a commissioner is a very time consuming job if you do it correctly. I hope people learn one thing from these discussions. It took years of the BOC saying OK to rapid development. It will take years to correct. Not staying involved and informed will result in a replay of these growth questions.